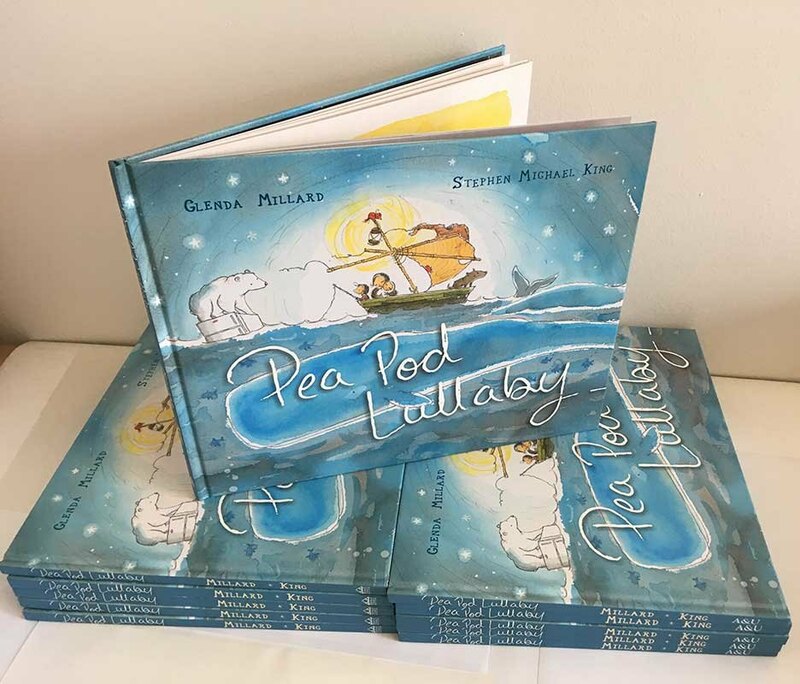 The Pea Pod Lullaby (originally titled Poem and then I, You, We) had been sitting in my in-tray for a while. Like many artists I know, my studio was a mess, my mind was filled with ideas that wouldn’t land on the paper like I wanted them too. I had a list of books I needed to illustrate and the few books that I was working on were already on tight deadlines. I was chewing at the bit to start Glenda’s book but I was struggling to find a space after a year or more of waiting. 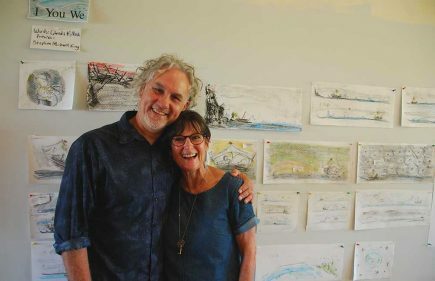 My local art gallery, The Manning Regional Art Gallery asked me if I was interested in being involved in their wall project. They invite artists in for a week of doing whatever artists do with a wall: some draw, some paint, others created mixed media tapestries. One project I saw was an artist who asked visitors to write down a secret or a fear and put it into a box. That night the artist would stitch with coloured wool onto material the words from inside the box. As the week went by the wall grew with strings of wool and coloured words. It was amazing. I began the wall project two days ahead of Glenda’s arrival. I work fast. I sketched a rough layout of the whole book and then loosely sketched each spread one by one. I cut Poem into stanzas, shuffled them around and pinned them onto various spreads. The wall was already looking messy and arty. When Glenda arrived on day three she pondered for a while, then she suggested changing a stanza from one space to another. After that initial move we spent three days moving stanzas, redrawing spreads, adding verse and pondering a new title. The week spent in the gallery was absorbing. I often forgot people were watching me. Everyone visiting could hear us discussing, and from the feedback I received we had some pretty interesting discussions. There were some great ideas from visitors too. One was a year 12 school girl who suggested that I paint the boy taking the baby from the mother as she steps into the boat. It was a nice touch. 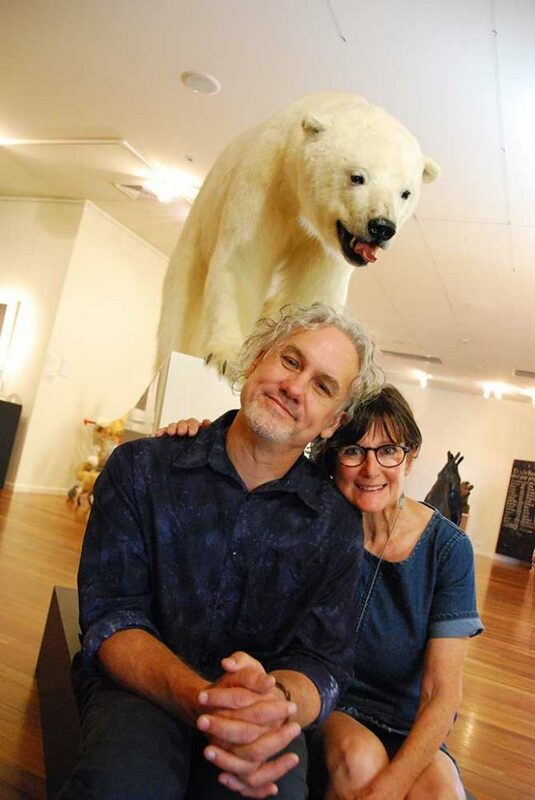 I have to thank the artist Rod McRae for his inspiring polar bear from the exhibition Wunderkammer. Overall it was a great experience. The finished book, now titled Pea Pod Lullaby was not too different from what was created at the gallery. There were a few subtle changes but I can’t even remember them. 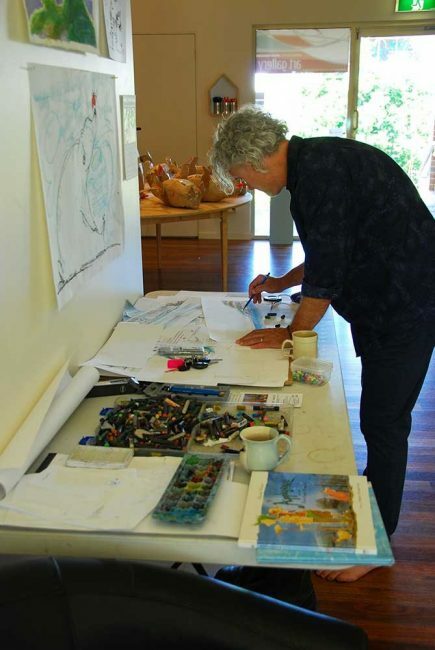 I’m onto illustrating my next book and trying to write another. 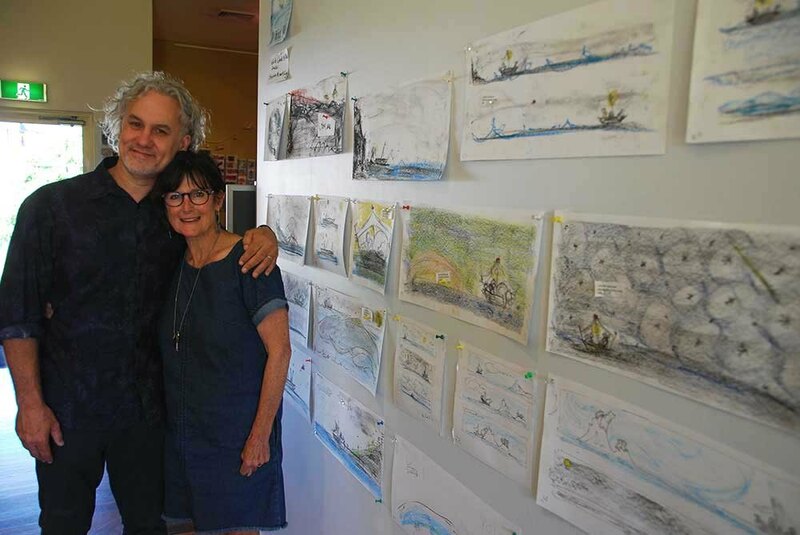 For a book that started as a poem for carers and children/families with cancer (Hush Treasure Book), it had grown into something that spoke to them but also for all of us and our planet. Stephen and Glenda at the wall.